IREX proudly presents to you the products that meet European – based standards IEC 61215, IEC 61730 issued by TUV Rheinland and UL 1703. 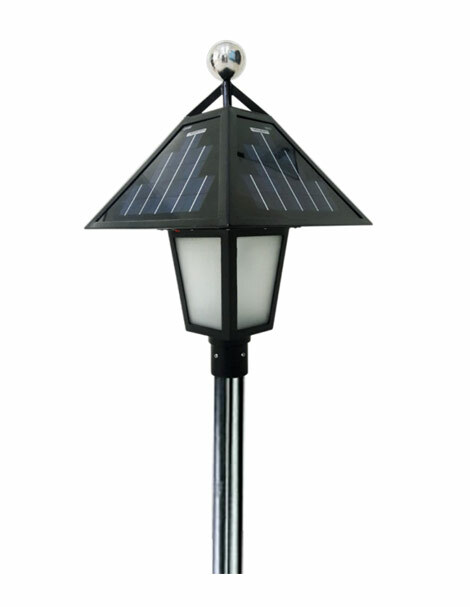 Solarcell,is the most basic component of a solar panel, it converts light energy into electrical one. 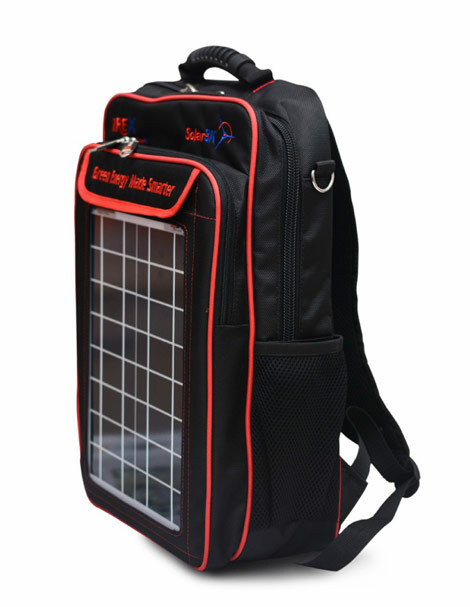 The electrical amperage, voltage and resistance of solarcells varies depending on the light intensity which reflects onto the cell. 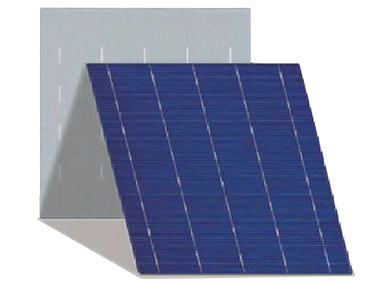 The manufacturing process of IREX solar cell has many features. With modern machines and equipment, IREX has researched and successfully put 5-busbar solarcell into production, PERC solar cell with efficiency reaching up to 22%. More than that, production line is advanced and 100% automated which controls and minimizes errors within the smallest phase. 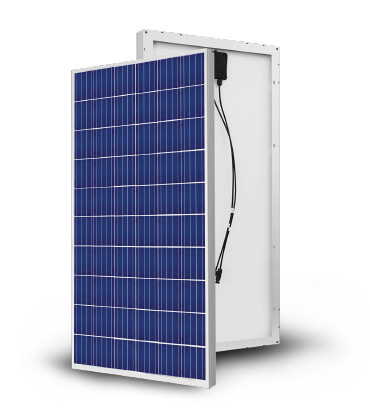 Currently, the factory is able to produce a diverse range of solar panels such as: Poly 156*156, Poly 125*125, Mono 156*156, Mono 125*125, etc., guarantees efficiency of over 80% within 25 years. IREX is fully autonomous in production without third party, together with the large capacity of IREX factory and automated production line help reduce the labor cost and maintain the stable and competitive price in domestic and international markets. 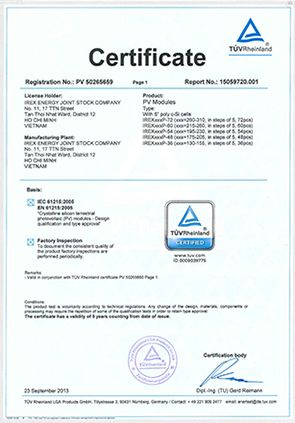 By getting many international and national certification such as TUV, UL 1703, IEC 61730, IEC 61215, CSA, ISO 9001:2008, etc, IREX's solar panels have been exported to many countries all over the world, especially the choosy market such as Europe, America. The product's efficiency of over 80% is guaranteed within 25 years. IREX is fully autonomous in production without third party, together with the great capacity of IREX factory and automated production line help reduce the labor cost and maintain the stable and competitive price in both domestic and globals markets. 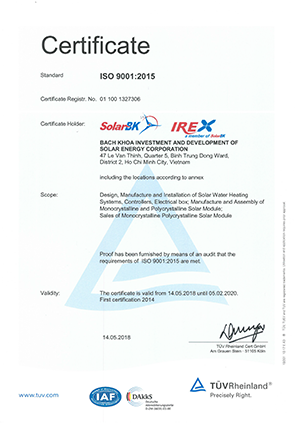 SolarBK was certified with “TUV Rheinland Certification” IREX’s solar panel product range and và implementing “Up to 60% energy saving commitment” program for Solar Water Heater system (industrial scale). 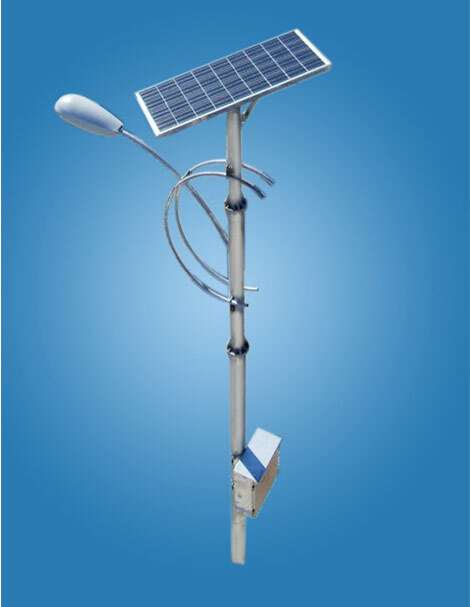 Power generation from solar energy is booming all over the world. Safety, quality, durability and reliability are indispensable prerequisites for SolarBK’s success in the photovoltaic market. European standards certificate is the key for SolarBK to bring products not only into the domestic market but also into the foreign export market. 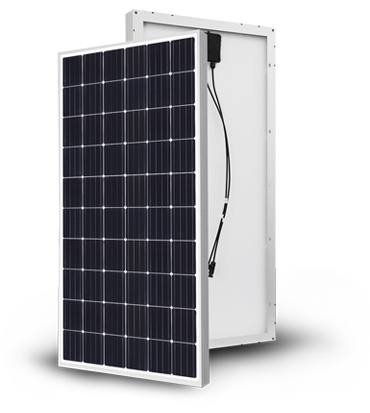 SolarBK was certified with Safety standards compliance to IEC 61730” for IREX’s solar panel product range. 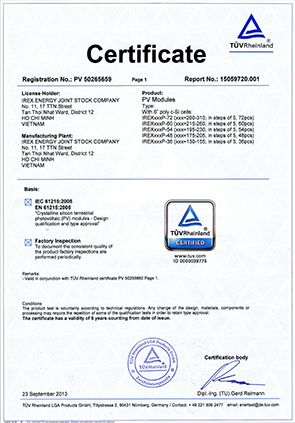 May 2018, we were certified ISO 9001-2015 by TÜV Rheinland organization. SolarBK was certified with “UL 1703” Certification for IREX’s solar panel quality. 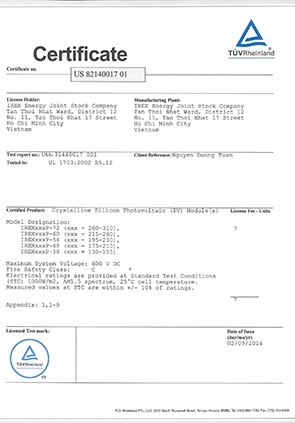 SolarBK was certified with design standards compliance to IEC 61215 for IREX’s solar panel product range. International standards certificate is the key for SolarBK to bring products not only into the domestic market but also into the foreign export market. 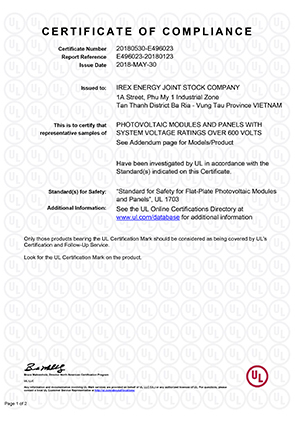 IREX – member of SolarBK was certified with Safety standards compliance to IEC 61730, IEC 61215, UL 1703” for IREX’s solar panel (Poly 320W) product range.